Danny's on a TRUCK! AWESOME!!! Wow, he sure does look good if I say so myself, and so do the apples! ; ) I just need to carry my camera around with me at all times in case I see this fantastic truck rumble by. 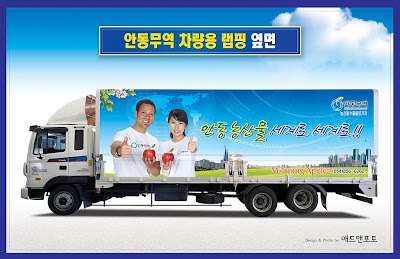 Maybe Danny can sign the truck, and we can sell it for money, and he will become rich because of his apple photos, and then we can buy all the apples we want in Korea, and THEN WE CAN RULE THE WORLD!!!! (Ok, sorry I got carried away again.) Well, it's just another day in Korea... more strange adventures to come! My last post had a lot of writing, sorry, so to balance that out, I thought I would show a lot of pictures this time. Today was the first truly chilly day, so I'm glad I'm doing this fall post before snow is on the ground. The more we are here, the more beautiful I think Korea is... especially in the fall. Danny and I joined my co-teacher, Mrs. Byeon, and her family as they climbed Gungmangbong mountain in the Sobaek National Forest. It was soo beautiful with all the trees changing, and I would have to say it is the most beautiful place I've been in Korea so far. As we hiked to the peak, we saw a lot of these stone piles which is a common site in Korea. My co-teacher said that people pile the stones to represent prayers everytime they come to a place. I think it is mostly a Buddhist thing, but I think the balancing stones are really beautiful to look at all over Korean hiking trails. This hike let us see tons of little waterfalls and red, yellow, orange, and green leaves everywhere. This picture definitely solidifies that fall is my favorite season in Korea. We stopped about a kilometer from the peak to have lunch and we ate the classic "picnic food" Kimbap. This is Korea's version of the california roll, and on this hike I discovered why people eat it so much. I had it before, many times, but never "go chu" style which means "red pepper". Spicy kimbap is definitely the way to go and it really does make an awesome snack. The whole trail was next to a stream, and Danny got this awesome picture of water flowing down a huge rock covered in fallen leaves...beautiful. As you can see, we were really happy to finally get to the top of the mountain. Gungmangbong Peak is only 4,662 ft high, but because we start at almost sea level and Korean mountains can be pretty steep, it was a tough hike. Korea is about 70% mountains and we really got to see that once we reached the summit. I like this picture. Danny looks like he is at the top of the world. It's funny that in some ways, even though I come from the best state in the US, coming to Korea has made enjoy the outdoors more. (And it makes me miss Colorado even more because they look similar.) I hope I can just have a little more time before the dreaded Korean cold winter comes in full force. Well, if this past weekend happens to be the last nice one before the winter hits, it was a great way to spend the day! I'm sorry that the second half of this post has taken me some time to do. We have had a lot going on here in Korea, like some of my awesome family visiting, and it has kept me from finishing the story. I'm excited, however, that today is finally the day and even though I am still struggling with the fact that I will never truly express the insanity that this day held, I will do my best and hopefully, at the very least, it will make you want to experience a Korean "hiking club" for yourself. Danny's face says it all. Imagine what you feel like after you have hiked for a couple hours. We were tired and ready for a relaxing ride home in a train. Now imagine as you are about to board the train, you notice people loading equipment for what seems like a rock concert: a tv, keyboard, mics, large speakers, and more. Oh no. Danny and I boarded the train and knew that it was possible that our relaxing ride home on the train was slipping away... but we were hopeful still. The ride to the hike was strange, yes, we played some crazy games, yes, and we were force fed some shots, yes, but it was nothing we couldn't handle. But now the flood gates had opened!! We were all getting sushi for supper on the train which we were excited about, but did you know that Koreans think that the best thing that goes with sushi is liquor? The plates of Korean sushi (or mostly sashimi) came out and so did the beer and Soju. Instantly, as you can see above, the "shy" Korean people got more lively and in the mood to party and oh, how they can party. Then the music started playing. Not easy listening dinner music but Korean No-Rae-Bong. I didn't even know that karaoke on a train existed, but it does! The first guy up to the mic was the man who invited us in the first place, Mr. Kang. As you can see he wants to get this train off to a good start, so not even 5 minutes after we had left the station, Mr. Kang was putting his heart and soul into the song. People weren't out of control, though as they ate their sushi, drank their beer, and listened to someone sing them a song... that didn't last long. The three of us, Danny, me and our friend Andrew were getting some good laughs at the situation, and people seemed to enjoy coming to "talk" to us so that was fun. Mind you I say "talk" because they speak Korean and we speak English so that hindered deep conversations, but there is one language Koreans speak that they believe crosses all barriers... beer. Every time someone would come to say hello, they thought that we looked like we needed more beer so all of a sudden it seemed like we had multiple bottles of Hite (awful Korean beer) and Soju each. They all wanted to do a round with us so they proceeded to pour us a glass and unfortunately it is rude to refuse a drink from a new person. (Again here is a disclaimer: we did not get drunk. Somehow, despite their efforts, we made it out in one piece.) Towards the end of the ride instead of chanting "GOMEBAY!" (which means "bottoms up!") with each new person who wanted to drink with us, we made up our own cheer... "HITE, CASS, MAX, CHUMBAWUMBA!!" Hite, Cass, and Max are all Korean brands of beer and we added the "Chumbawumba" part in hopes that the Koreans would think this was a popular phrase in America and spread it around the land. Soon most of the train was yelling our chant, but knowing their state, I don't think they will remember much anyways. Two minutes later: Almost like a choreographed teen movie, all the 40 and 50 and 60 year old Koreans got up and started dancing uncontrollably in the aisles. Yeah, PARTY TRAIN! The music was bumpin', the dance floor was ragin', and all their little hiking bolo ties were bouncing merrily to the music. Of course, we had to sing. There is no joining a hiking group and thinking you will only be hiking...NO! You must sing your way back to your home, and that is what we intended to do... even if it was by force. I chose "Dancing Queen" by Abba which was a hit, even if I did sound tone deaf. Danny chose the Beatles "Twist and Shout" which also got the people dancing much like "Ferris Bueller's Day Off." Then came Andrew... the real dancing queen. Occasionally we needed to sit down and rest during the 3 hour ride. Seems reasonable enough right? NOOO... the Koreans would have none of that. As soon as we tried to rest, one of us would be pulled out of our seat and forced to either dance, sing, or drink. Poor Andrew seemed like he got the worst, or the best attention from the Korean ladies. I love this series of pictures showing how desperately they wanted Andrew to dance with them, while Andrews face becomes just a blur of horror, anticipating what they will do to him next. Because of their eagerness to have us "enjoying ourselves", we found the only place to rest was the next car over. The blanket of sweet silence that covered us in that train for only a few moments was a welcome relief. Here you can see how one train can hold so many different scenes. We had never laughed so much in our lives and as the train pulled into the Andong station we felt a mix of sadness and utter relief. All that was left was a floor covered in sweat and alcohol, 60ish Koreans with hoarse voices from singing too loud, and this half eaten cucumber. The last words we heard from the lady in orange who would have been crowned the "Party Train Queen" as she got into a cab were a very subdued, "Good Evening." A fitting end to a unbelievably, indescribable, and unforgettably chaotic experience. Good times.